Last week Joan left a comment asking me about a warm borani made with eggplant. Well ladies and gentleman I present to you Kashkeh Bademjan, also known as eggplant dip or if you want to get really fancy you can call it Dip de Aubergine, oh la la!!!! Kashkeh Bademjan is by far one of my favorite appetizers. 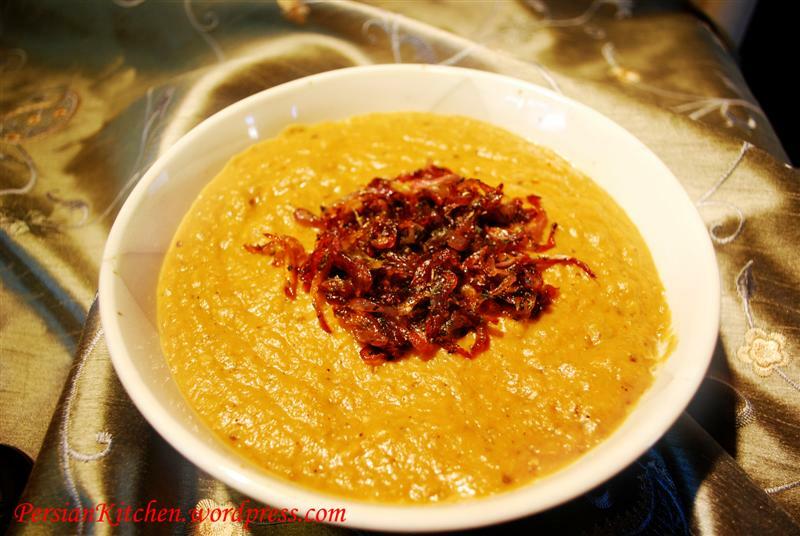 It is a delicious blend of eggplants, garlic, and Kashk which is whey. I love eating this appetizer with lavash bread. This was my first time making it and it was actually pretty easy. Sprinkle a generous amount of salt, add water to cover the eggplants, and give it a mix with your hand so that the salt is diluted. Make sure that you do this step because what you are doing right now is removing the eggplant’s bitterness. Since eggplant is buoyant, place a dish on top of it and put something heavy to hold it down. I put a glass on mine and it worked out great. In the mean time sauté the onion and garlic for the dish with 2 tbsp of oil on medium and the one for the garnish in 1 tbsp of oil. For both of these it is best to use non-stick pans. For the garnish just let the onion sauté on the low. What you want is for the onion to get a bit crispy towards the end. This is going to take a while so be patient and make sure you give it a stir every so often. Fry the eggplant until it turns brownish. This should take about 20-30 minutes. Then add 1 cup of water, tomato paste, cover, and let cook for about 30 minutes. At this point season with salt and pepper. Once the liquid starts boiling, take a couple of tablespoons out and place it in a small bowl and add the saffron to it. The liquid will turn into a bright orange color. Add it back to the eggplant and let it cook. The warm water will release the saffron’s flavor. Place in a serving dish and garnish with the onion and mint. Serve warm with bread. If you don’t have access to a Persian store where they sell kashk, you can substitute with sour cream, but this will change the taste. This post has enspired me to actually try and make homemade kashk. So check back again for my next experiment!!! Just reading about it had my mouth watering! You are very welcome Joan. I look forward to reading all about it!!!! I’ve enjoyed reading all of your recipes. I found your site while looking for a recipe for kuku. Lamb, dill and lima bean has always been one of my favorites and am eager to try the kuku. I am half Persian on my father’s side and would love to make Kashk Bademjam as this is one of his favorite dishes and something that my mother and I have yet to conquer. There are no Persian stores nearby. Do you know if the Kashk from Sadaf needs to be refrigerated before opening or if it is something that is safe until open? Thank you for stopping by. Until this past Norouz I had only seen kashk in refrigerators at the stores. For the first time I saw a brand that did not need refrigeration before opening. I have only seen Sadaf’s kashk in the refrigerator at the markets. Additionally, the bottles also have a “Keep Refrigerated” note on them. Another option that you may want to look into is purchasing dried kashk. My mom was here recently and she found some at a Persian market to take back with her. In case you can’t get your hands on Kashk a close substitute is sour cream. Not the same taste, but close. yumm!! egg plants, one of my fav vegie from all.. cant wait to try this out.. look delicious.. thank you for sharing.. ill let you know how it turned out..
Like Desiree, I came across your blog while searching for Iranian recipes using dill. I absolutely love Iranian food and ate often in an Iranian restaurant in Paris. Do you have a recipe using Dill and Beef or Chicken? Love your pictures and explanations, makes it very easy to follow. Thanks again. I can’t wait to hear how you like it. Please keep me posted!!! Welcome to the site. I am so glad you found us! I do know one rice recipe that is made with rice and dill. It is really good and they usually make it with lamb shank. It is incredibly good. I have never personally made lamb shank, but I think you have inspired me to give it a try. It is now on my upcoming recipes list. I will look for the dried kashk. The kuku was truly delicious and looked beautiful. I was too afraid to flip the pieces over individually so actually just turned the whole thing over into another preheated oiled pan. I used EggBeaters instead of fresh eggs to cut down on the cholesterol. Thanks for the recipe. I am going to check out a Persian store in Chicago and Milwaukee for the kashk. I’ll let you know how it tastes!! Thanks for sharing your recipes and pictures. I am so happy to hear that you liked the kuku. The flipping part is the hardest part and I don’t seem to ever be able to do it nicely. However, the way you did it is very clever. I know that you can also make Kuku in the oven, but I have never made it that way before. Let me know how it all goes with the kashk. My husband found your wonderful website while helping me try to find an eggplant recipe. We have a wonderful Persian Resturant not far from our home that has a wonderful buffet. My husband is Persian and said it is the closest thing to home cooking he has experienced since he left Iran . I love Persian food and have a wonderful cookbook which I have used on many occasions. This resturant serves an awesome baked eggplant that is heavenly. The flavor is rich and decadent and now when we go to the buffet i search under all the lids until I find this wonderful treasure. I love Kashkeh Bademjan but this eggplant is different as it is not pureed it is sliced into rounds and baked with other seasonings and sauces but I am not sure what they are. I have searched the internet for a recipe and have found nothing that even looks like it. PLEASE help me with this I want to make this for my husband. To be honest, I have no idea what it is…what are the spices used? What color is the sauce? Is there tomatoes in there? OH MY thank you for your quick response! No it is not the same as the Zucchini stew what I will do the next time we go there is take a photo and post it so you can see what I am talking about. I called my sister in law and she helped me out on the spices so today is the test! Thank you so much for your assistance and wish me luck!! I think Janelle may be referring to Mirza ghasemi…not not sure. I cannot wait to go out and buy more eggplant to try this. I’ll be sure to grind my saffron before adding the hot water. Thank you for all of your wonderful recipes and tips. I just finished making this and it came out delicious! Unfortunately I didn’t have any kashk so I used sour cream. I can only imagine how much tastier it is with authentic ingredients. Do you know what I would have to add to give it the spicy kick like the version that is found in Indian restaurants? Again, thank you for sharing your recipes! Amnah, so glad to hear that it came out great even without using kashk. Hmm don’t know about the Indian version but you can maybe try either a fresh chili or use powdered chili purchased from an Indian store which is different than the ones at regular stores. what a great site! i don’t really cook anything from persian food (although my husband is persian and i like persian food because of my mother-in-law cooking) but maybe i’ll change my mind after reading these recipes:). Simbelmyne, welcome!! I hope you will start making some Persian dishes from now on forward!!! Thank you for linking to me! I just love your recipes and your pictures. I am a big fanof Persian food and beign able tomake those favorite dishes at home is awesome.My daughter who is a very fussy eater loves allthe dishes I make from your blog. thank you for inspiring us! I did use Kashk I ordered online and must admit I was nervous when I saw “keep refrigerated” on the jars However it was shipped from LA and made it here the next day. Not sure that is such a good idea though. Might ask them to send it in a foamed box with ice bags. Thanks for the recipe though… excellent and relatively easy to do. Thank you for this recipe. It was really delicious! I’ve been cooking Persian food for my Persian bf for 7 years now and am always trying out new recipes. I find your site very helpful. I just have one question regarding kashk and I was hoping you could help me. How do I liquefy a powdered kashk? You see, what I normally do is just add water to it, stir it, and let it sit for a few hours before using it, but it never turned out to be homogenized. Instead of turning out into a creamy mixture, the kashk powder settles at the bottom undissolved and unmixed. Any advice on this would be highly appreciated. This is my favorite dish! I will be making it for my family tonight. Would you please tell me how long I should soak the eggplants in the water for? Olga, you can use Sour Cream. I am so thrilled I found your website..it is absolutely the best! I adore Persian food and now I will be able to make it..thank you so much! I live on the west side in Los Angeles and was wondering if you know where I can find a Persian market..I want to try making your Kashkeh Bademjan recipe, as I love this dish. And I want to make your Fesenjan recipe. I recently made your Sunshine Chicken and Zareshk Polow recipes and they were a big hit..everyone loved it! Thanks! Have been married to an Iranian for 41 years. We make Kashk-e-Bademjoon with a combination of Lentils & sautéed Eggplant. We sauté Mint with a little olive oil & sauté chopped Garlic until golden brown. After putting dip in serving dish,we make a design on top with the mint,garlic, & chopped walnuts(since we grow Pecans we usually use those instead). The kashk I have came from Iran, it is in bags and shaped like balls. I keep it in the freezer and take out as many as I need. After they thaw I mix them with a little hot water.